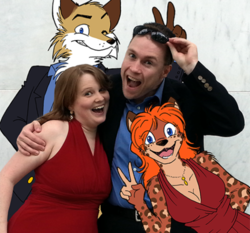 Mandy Seley and Fox Keegan are the creative duo behind CurtailedComic.com: a weekly webcomic centered around their most entertaining experiences generated by their unusual approach to life. Jacks of all trades and Masters of some, they've passions ranging from art, gaming and cosplay to most forms of engineering, Do-It-Yourself projects and even survival prep. If they haven't learned it yet, they probably want to! These two use their skills, creativity, and simple inability to sit still for more than 20 seconds to regularly produce situations perfect for a slice-of-life comic that's both relatable and absurd. Not everyone makes their own armor, gets married in it, and then rides off in their own police-edition muscle car! Fox lends his quick wit and wordsmithing to both write and edit the comics. His personality is also usually the catalyst for the punchline! If not at the computer researching a new project, he's either working on his car or down in his basement workshop, soldering, welding or sanding.